Wednesday, September 16 through Friday, September 18 from 4:00 p.m. until 7:30 p.m.
Saturday, September 19 from 1:00 p.m. until 6:00 p.m.
Sunday, September 20 from 1:00 p.m. until 4:30 p.m. Established in 1891, Kikusuiro in Nara, Japan, is the oldest Ryokan (traditional Japanese inn). Since Kikusuiro used to be an Ochaya (teahouse) for Geisha, they have a lot of elaborate kimono. 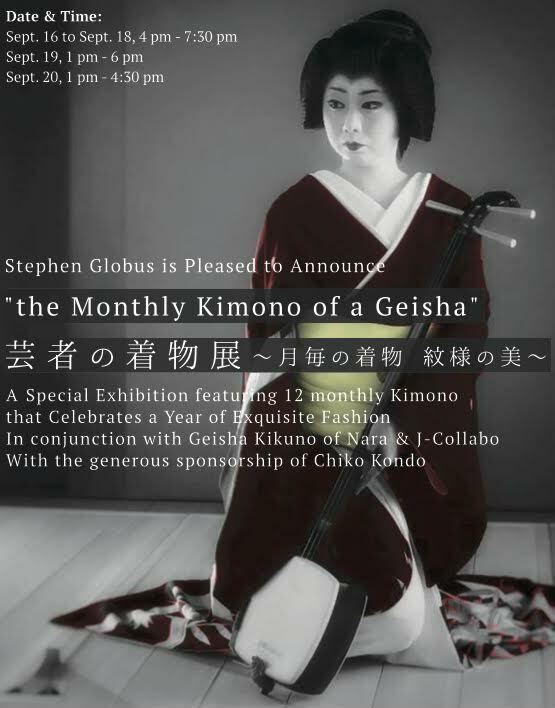 For this special exhibit, Kikusuiro has shipped twelve kimono to Globus Chashitsu; it is the first time their precious collection will be open to the public. Don’t miss this rare opportunity to see the monthly kimono of a Geisha at once. No reservation is required to view the exhibit. Thursday, September 17 and Friday, September 18 from 8:00 p.m. until 10:00 p.m.
Saturday, September 19 from 3:00 p.m. until 4:00 p.m.
For more information, please visit Globus Chashitu’s Facebook Event Page.